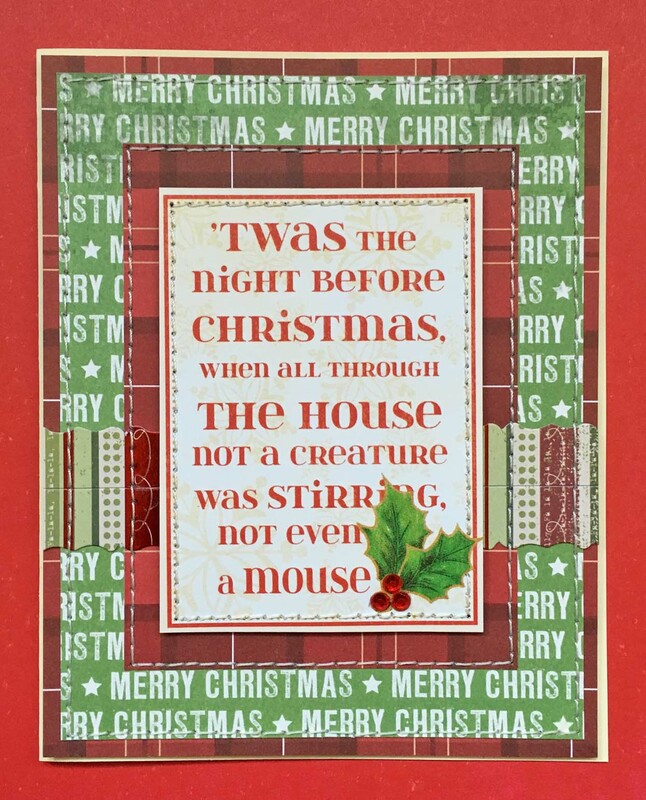 This week we're asking you to create a Holiday Card that celebrates TEXT. It might mean using letter stickers, book pages, dictionary pages, phone book pages, texty patterned paper or just creating a card where the sentiment is the star of the show … make sure you get TEXTY. 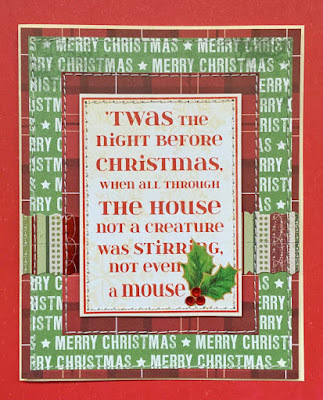 Stephanie says, "As often happens, I went searching for one thing in my studio, and got distracted by another discovery ... in this case, it was a piece of lovely texty paper from My Mind's Eye the Merry Days of Christmas ... which then took me on a completely different creative path. I added a craft tag, a vintage journaling notecard from Prima's Sweet Peppermint Collection and a sticker sentiment to finish the design." Lauren says, "Ok, so, as you may have noticed, this card is *FLAT*. Like... really flat. Yes, it's got a couple of layers popped up on foam tape; but no flowers, no lace, no big swirly gem flourishes... just a sentiment-centric journal card, a texty background paper and some pretty plaid mats. I kept trying to add more stuff, but it didn't look right. So I'm going with this. They might ask me for ID at the post office when I try to mail it, lol! I used the current Sketch Saturday layout, which is really cool and somewhat explains the minimalism." Link your gorgeous text-centric masterpieces right here by 6pm (EST) on Wednesday, February 7th. Keyword for galleries and Flickr is JB:18:08. We could not be more impressed by the fabulous cards you guys came up with for "We Three Kings". The only "problem" we had was only choosing a trio of them to feature! ...cleverly STACKED her adorable trio of reindeer in a way that makes us think we should make LOTS more tall cards! ...made a card that's awesome in EVERY respect, and has also given us the perfect plan for how to use all the fun flair we've collected but haven't quite known how to use! ...knows a thing or two (or three!) 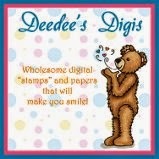 about stamping and coloring adorable bears. 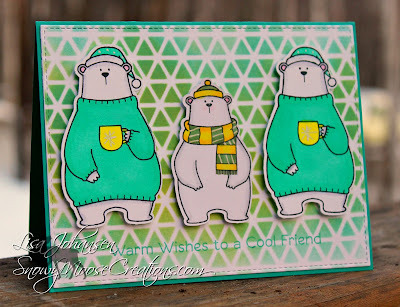 Not to mention that AH-MAY-ZING stenciled background! 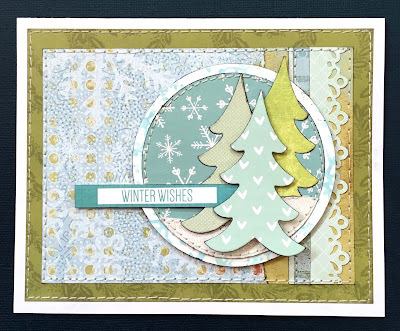 We're back creating in trios this week ... cards that feature three of a single design element. Lauren says, "My 'three' are pretty obvious this week-- in the form of red flowers so old I'm not entirely positive where they came from. I know they've got Eyelet Outlet Sticky-Back Pearl centers, though. And that they're accenting the scanned and re-sized vintage postcard I used as focal image. And that my layout is based on the awesome current sketch from Sketch Saturday." Stephanie says, "I liked the paper I used last week so much, I used the rest of the 12x12 sheet to make a second card. I call this one a triple-triple ... three groups of three ... don't you just love those little snowmen. 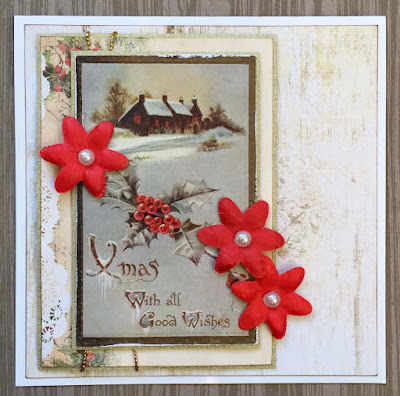 all I had to add were a few paper scraps, a sticker sentiment, and a couple of enamel dots to add a little dimension to the balls on top of their winter hats." Scroll down to the original post to see the already awesome Readers' Gallery and link up your own masterpiece! We Three Kings - that means this week we're creating in multiples of THREE. We're asking you to create a card with THREE of one element … three circles, three reindeer, three packages under the tree … you get the picture. 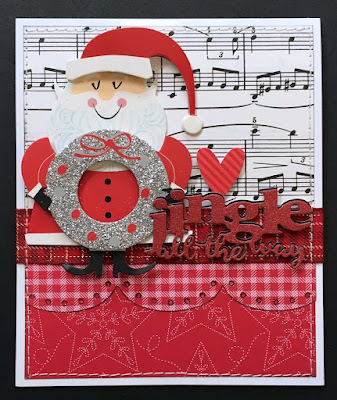 Stephanie says, "I took my inspiration from a Jingle Belles card I made in January 2011. I die cut three stitched squares using Lawn Fawn Outside In Stitched Square Stackables Dies and then stamped three circle snowflakes (from Simon Says Stamp Circle Sayings Holiday) and used a 7/8" punch for my circles ... I finished with Eyelet Outlet enamel dots in the centers. 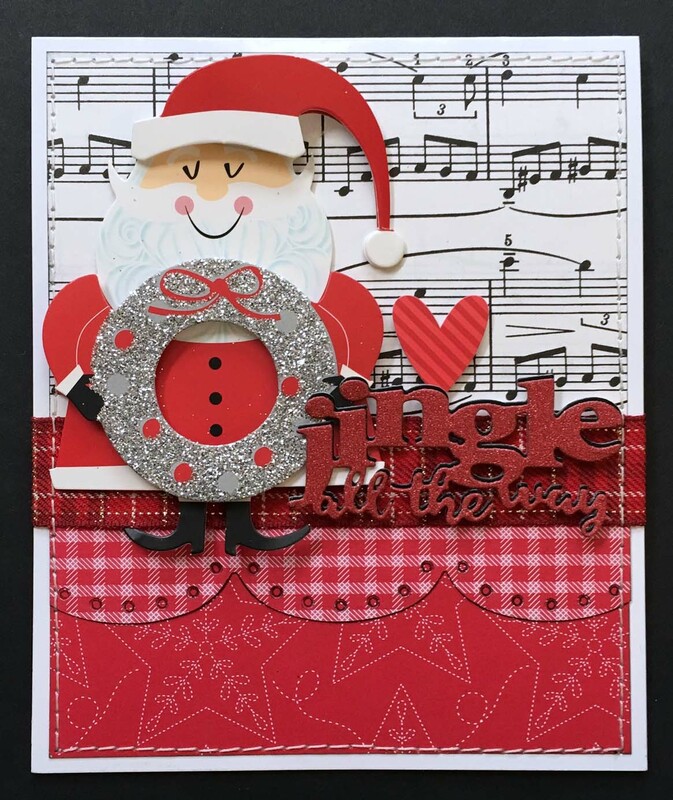 My card base is 5" x 12" two-sided vintage Basic Grey paper with scores at 2" and 4" from the edges for an off-set opening. You can click-through to my blog to see how it opens. 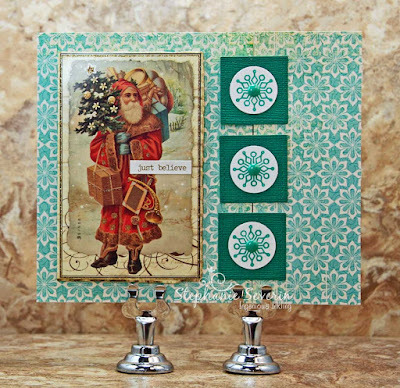 The vintage Santa is recycled from a holiday card with a sticker holiday sentiment." 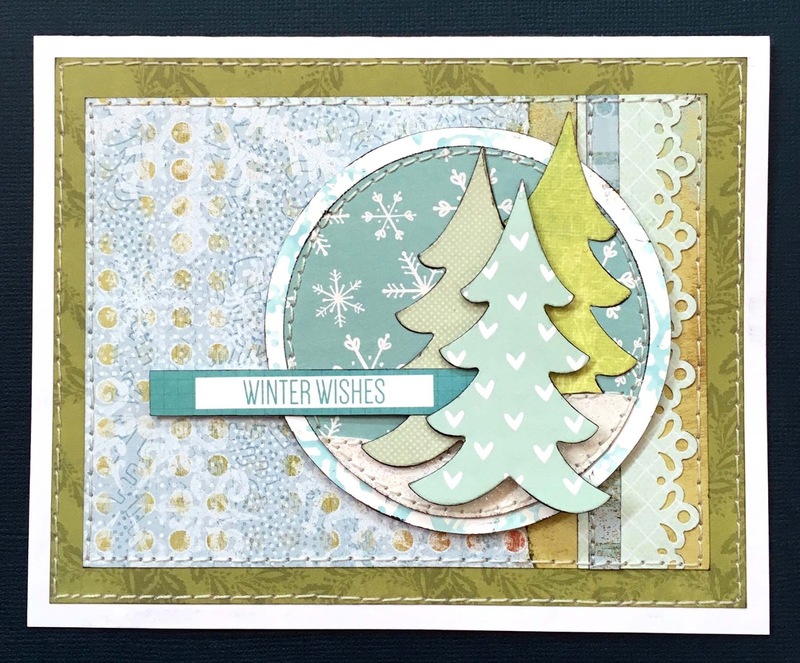 Lauren says, "My card features three of my favorite Echo Park diecut trees. I'm trying a new way of organizing holiday scraps this year: rather than let loads of tiny pieces of paper accumulate, I've been trying to either toss or diecut any scraps that are too small for anything except tossing or diecutting. I'm hoping that having a little cache of pre-cut items will make "composing" my cards a bit faster; as well as making it possible to sometimes make multiples in weeks where I've got more than one idea. The plan seems to be working so far; in fact there are two more cards with three trees each on my blog today!" Link up here by 6pm (EST) on Wednesday, January 24th. Keyword for galleries and Jingle Belles Flickr is JB:18:02. 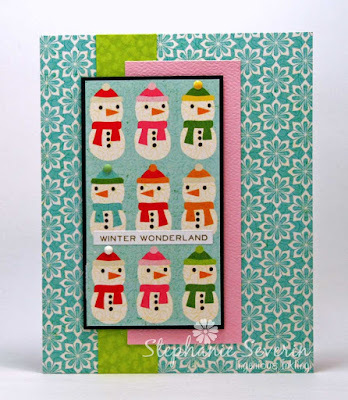 ...used her brand new, super-cute penguin, tree and sled stamps to create a card that is so utterly adorable, we almost can't stand it... but you know, in a GOOD way! ...not only used her awesome new dinosaur stamp in a super-clever way that totally blows our minds, but she's rockin' a new skill, as well-- just look at that watercolor background! ...has very cool Santa-like daughters who brought her an electronic diecutter for Christmas, and she is already making amazing cards with it! so we can get your prize on it's way to you! We're still creating with the goodies that Santa brought us this year ... Be sure to tell us in your post what fun new items you are using, so we can all be suitably envious. Lauren says, "Here's a shocking true confession: apparently when I put away this awesome Cut-plorations "Jingle All the Way" die after receiving it for Xmas 2016 (!) 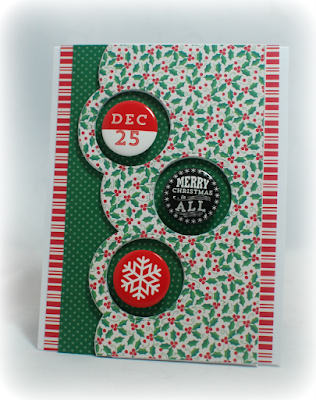 from Santa Stephanie, it had slid down to the bottom of the flip-thru storage box i use for my holiday dies. And since i couldn't see it, it just ceased to exist. So this is the very first time I'm using it, but definitely NOT the last, in fact I should probably apologize in advance for how many times you'll be seeing this thing in the near future, lol. 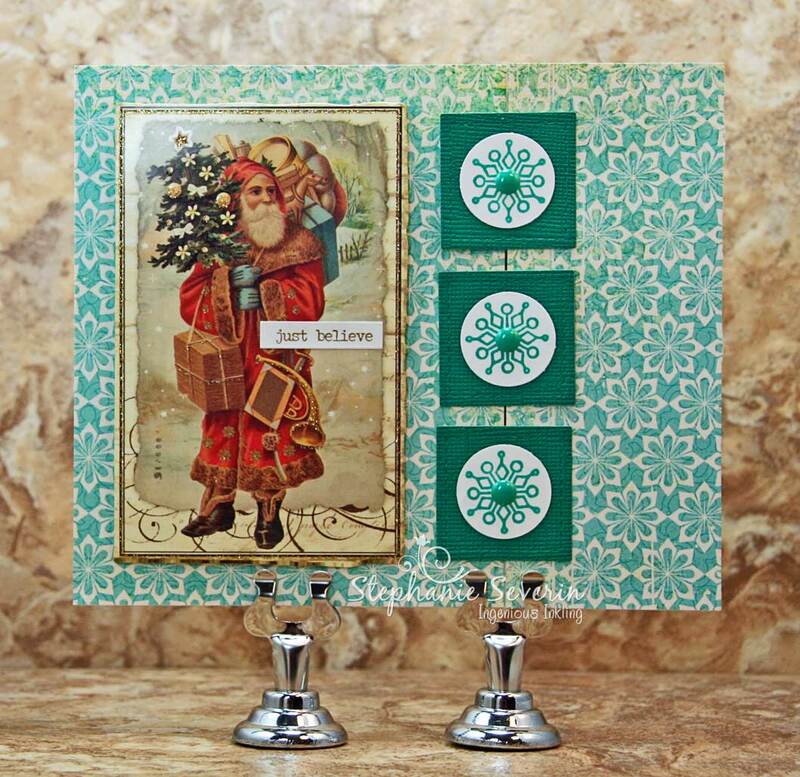 In addition, I'm showing off are more gorgeous 6x6" papers from a set called, "Quilted Christmas" which also came from Stephanie, my favorite Stampin' Up demonstrator!" 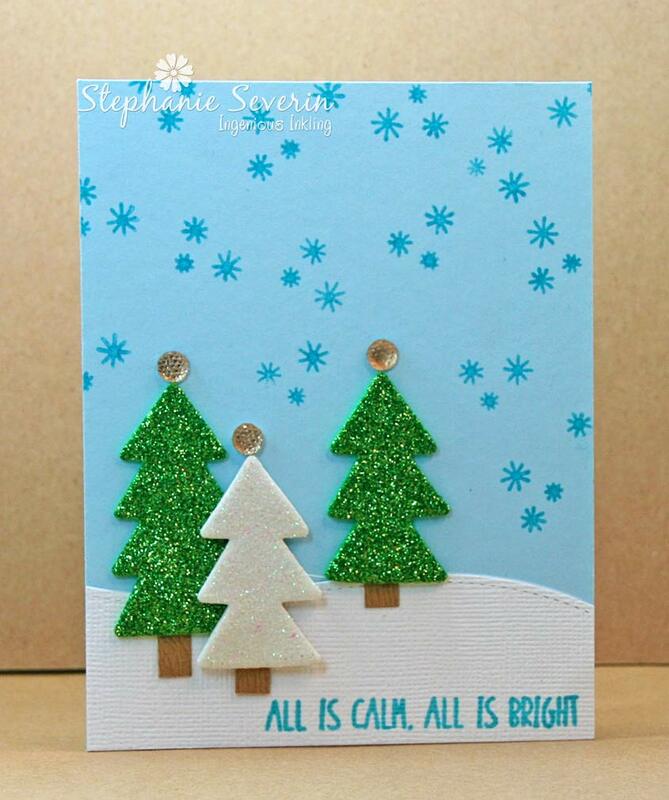 Stephanie says, "I realized as I was looking through my yet-to-be-used new stash, that I had yet to ink one of my Christmas gifts that I got from Santa last Christmas (I know ... embarrassing), so that is the set I used for this card -- Neat & Tangled Scandinavian Prints Christmas Die Cuts for the adhesive glittery felt trees and for the sentiment too. I filled the sky with snowflakes from Essentials by Ellen Bear Ware 2." To start 2018 off right, we're celebrating all things new by using new things to create our first holiday card of the year. Specifically, we're asking you to gather-up the new crafting goodies you received for the holidays and put them to crafty use! Just in case all you got from Santa was a bag of coal, break-out something from your crafting arsenal that you haven't created with yet. OR... perhaps you'd like to hit those fabulous "After Xmas" sales and treat yourself to a bargain or two?! Stephanie says, "I've had this Simon Says Stamp Ring Wreath on my wish list for quite some time ... for its first use, I filled the black cardstock die cut with two colors of teal glitter cardstock (if you enlarge, you can see the subtle difference in color) and silver glitter cardstock. 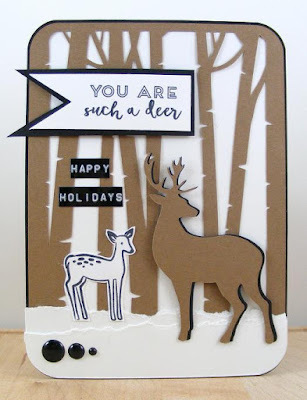 I finished with a Joy sentiment from Simon Says Stamp Big Words-Encouraging Words and a punched black cardstock bow ... this card just screams mid-century modern to me, which is a design period I love." 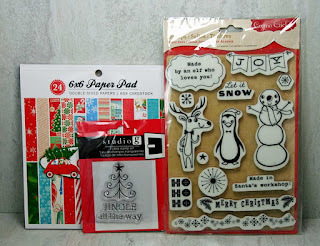 Lauren says, "My blogging partner and crafty BFF Stephanie (who is also a Stampin' Up representative) gave me a gorgeous double-sided SU collection called, "Quilted Christmas" which I just couldn't wait to use! I'm not sure how both the green stitchy pattern and the glorious red gingham wound up as mats, but I love how they look. 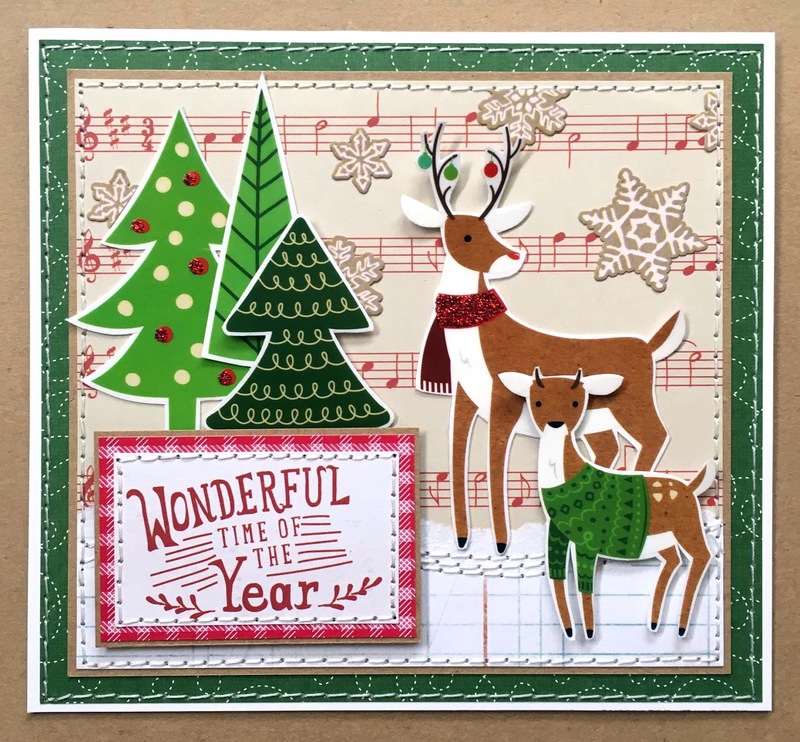 Meanwhile, those handsome reindeer and the fun holiday trees are from an American Crafts sticker sheet that came in a big bundle of xmas stickers I bought from one of my favorite daily deal sites... just a little too late to use in the 2017 JB season. 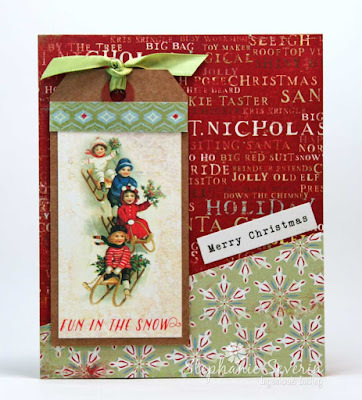 I've added in some ancient Love, Elsie music paper and Hambly snowflake stickers to round off this fun winter scene." 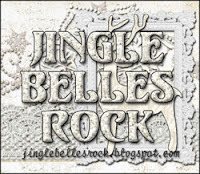 And to get your new year off to a great start, we Jingle Belles will be sharing a prize with one lucky (randomly selected) participant of our first prompt of 2018. 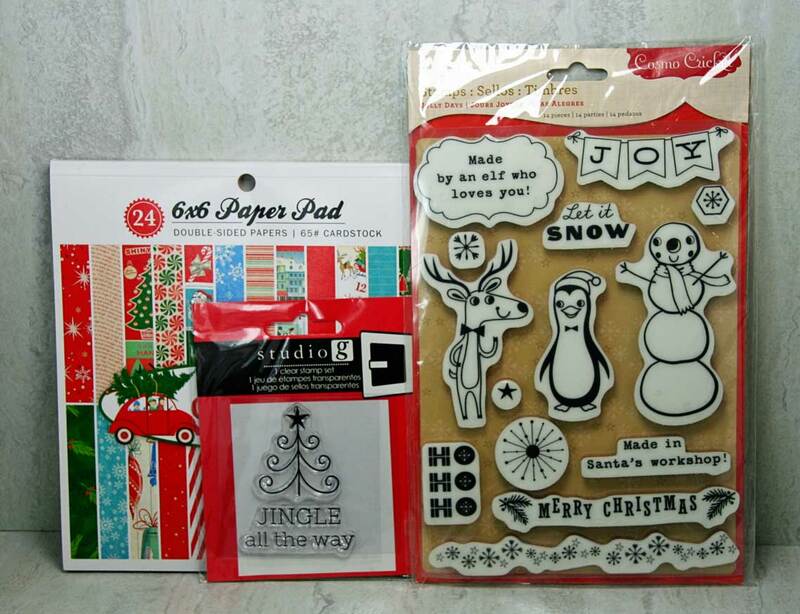 You know you want that cute little holiday trio, fun Christmas papers and that tiny holiday tree ... so come join the fun. Link up here by 6pm (EST) on Wednesday, January 10th. Keyword for galleries and Flickr is JB:18:01.